Once upon a time, a school friend and I decided to cut school and head into Dublin’s city centre. We made our way straight for a mini-mall where there was a record shop which was one of a few which sold some up-to-date metal in a corner surrounded by Duran Duran and The Human League. There was an album there called Speed Kills, a compilation with up-and-coming thrash metal bands, and Swiss band Celtic Frost was one of the bands featured and one, apart from your Slayers and Metallicas that we had read about. The track was ‘Into the Crypts of Rays’, and so we asked the New Romantic girl behind the counter to play it for us (no Bandcamp or YouTube back then, kids). Can you remember hearing that intro for the very first time? This eerie choir of horror, startling at first listen, other browsing customers looking up to see what the noise was for it must have sounded *insane*, for my friend and I were left slack-jawed, and we were metalheads. And when the intro ended and the music burst forth with that opening rumble of a riff well, this kid was sold. I bought the record the following weekend with money from my part-time job I had in my father’s petrol station. I consumed the album, literally devouring it, for it was my spring-board to other underground thrash such as Destruction, Voivod and Possessed amongst others. Armed with this knowledge of metal I started purchasing those albums – War and Pain, Infernal Overkill, Seven Churches and Morbid Tales – and made many new friends in the process. As for Morbid Tales … as everyone reading this should know Celtic Frost was born, phoenix-like from the ashes of the once vilified Hellhammer. Guitarist/mainman Tom G. Warrior was somewhat disappointed with the production of their first recording, the kvlt Apocalyptic Raids EP, as well as what he saw as ‘unprofessional-ism’ within its ranks, not to mention being cheesed off and embarrassed with some bad press surrounding it (see the infamous spat with UK metal zine Metal Forces chief Bernard Doe). Little did Tom, or for that matter, the nay-sayers realise that a couple of decades later Hellhammer would be rightfully revered by fans and musicians alike as one of the most important and influential bands in extreme metal. It’s a sad fact, but such was the negativity surrounding the band in 1984 that it took that long for Tom to come to terms with Hellhammer’s legacy. In fact, I would go far as saying, to these ears at least, that Triptykon owe more of a debt to his first band than Celtic Frost. But I digress. On May 31st 1984 Tom sat down with bassist and partner-in-doom Martin Ain and planned out a whole new concept called Celtic Frost; album and song titles, sleeve layouts, etc, ‘typing it all professionally’, reinventing themselves, swearing not to make the same assumed mistakes as they had done with Hellhammer. They had planned to record a demo for Noise records – ‘Apocalyptic Raids’ was one of the very early releases by the fledgling label – but though Noise allegedly hated the EP they had already invested time and money in the keen Swiss lads, so they called Tom’s bluff and told him to skip the demo and record ‘Morbid Tales’ proper. 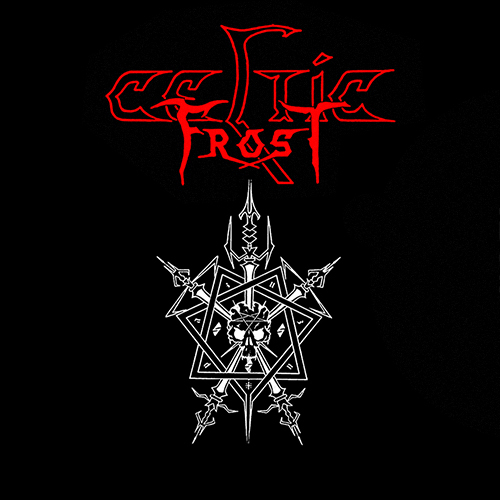 The album sleeve was a simple black background with the famous CF logo above, and ‘Heptagram’ below, with ‘Morbid Tales’ either side. Streaked across the top left hand are the words ‘Ex-Hellhammer members/Includes poster/Limited edition in black vinyl!’ However Hellhammer was an embarrassment to both Tom and Noise records, the label thought nothing of using their name to push this new product. 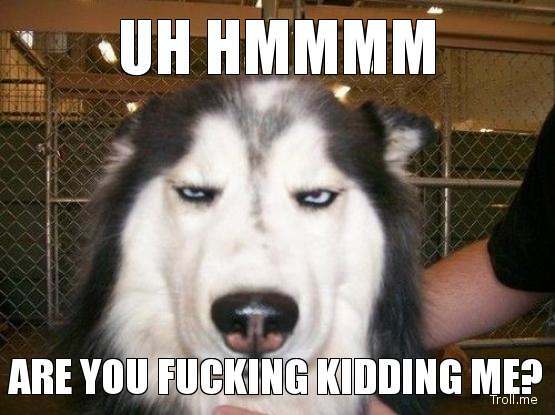 So what of the songs? 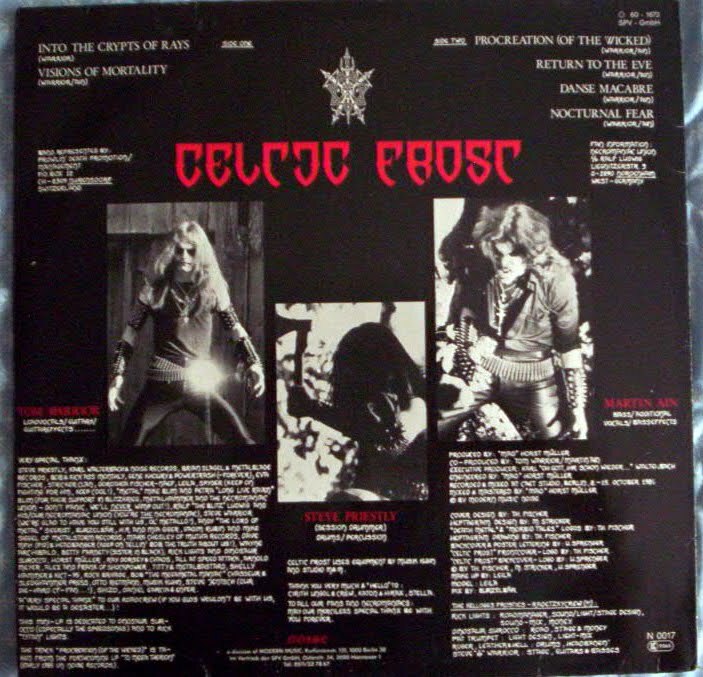 Well, after the ‘Human’ intro (not listed on the original vinyl sleeve) to the aforementioned ‘Into the Crypts of Rays’ Celtic Frost didn’t sound a million miles away from Hellhammer. This was dark and heavy, emphasis on the word ‘heavy’, riffs exhumed from the glory days of Black Sabbath, punctuated with the in-your-face punk attitude of Venom with the determination and stubbornness of a young band to make it work. And man, does it show. This was thrash as its most dangerous, Gothic before the Lacuna Coils of this world made it a bad thing, and way before the Bay Area would become synonym with the word. Not all fast, not all slow, ‘Visions of Mortality’ pounds along (an amazing headbanger) whilst ‘Procreation (of the Wicked)’ was Doom Metal without the frilly shirts and bellbottom jeans, and still one of my favourite songs to this day. ‘Return to the Eve’, boasts a tumultuous riff and a female voice over (inspired by Venom’s ‘Welcome to Hell’?) which they would later re-record for the rockin’ ‘Tragic Serenades’ EP. I was never fond of the instrumental of sorts ‘Danse Macabre’, but I guess it showed the Crowley-esque tinkering side to the band. And EP closer ‘Nocturnal Fear’ crashed and bashed its way out, ending with as many ‘Uh’s!’ as possible on a blatant Lovecraftian high. Tom has often claimed that he was never an accomplished musician, especially his guitar solos, but I maintain that it added to the overall charm of MT. They screech and squeal as if possessed; not a bad thing. Martin Ain’s bass holds everything together, rumbling threateningly in the background while the drums on this record are one of its high points. No one has ever come close to getting a drum sound like that. Godly. In the end, this is not so much a review as a gushing tribute. ‘Morbid Tales’ is a terrifically terrifying album of darkened thrash doom, one of the first of its kind. Despite Tom insisting at the time that Celtic Frost was not a Black Metal band MT continues to appear on Essential Black Metal Top Album Lists, and Death Metal for that matter. Countless musicians continue to name-check CF and MT - famously, when approached by MTV to front a metal show Phil Aslemo asked the producers could he choose the music himself, citing the kvlt 'Circle of the Tyrants' video. Needless to say they refused, and he turned the gig down - and there are at least a few bands out there who play a Hellhammer/MT-inspired metal, including the now defunct Japanese female trio Gallhammer, Apokalyptic Raids and Warhammer respectively. This honorary appreciation of a metal (genres be damned) classic should never end. Frosties rule. This is one of the albums that you had to hear in the 80s to dig it. I heard it about ten years after the release and extreme metal had gotten much more extreme by then. Thus Morbid Tales sounded unimpressive and outdated. Time's not a friend for some classic albums. I remember playing 'Danse Macabre’ in my little brother's cheesy toy turntable.. he was so scared I think he ran and hid in the closet.. Along "Welcome to Hell" this album is one of the pillars of all extreme metal, past and present... with a unique sound of its own.. heavier than anything ever heard at the time (except perhaps, Venom) this album remains and will always be an extreme metal classic! !